The pharmacokinetics (PK) and pharmacodynamics (PD) of a drug characterize how it works in the body and determine what dose is needed over what course of time. PK/ PD measures can vary depending on the patients’ age, gender, ethnicity, diet and the severity of their disease. So it is critical to understand a drug’s PK/PD in the target patient population to enable its safe and effective use. Typically, PK/PD data are collected throughout the development process. In the preclinical stage, data are collected to predict drug activity in humans and its effects against the parasite using sophisticated model systems.1 Predictions are then confirmed in clinical trials and a cycle of learning and confirming begins until the most appropriate dose in patients can be determined. Mark Baker, Associate Director, Translational Medicine, MMV, and a clinical pharmacologist, explains two innovations that are enabling MMV to accelerate the collection and use of PK/PD data to speed the development of next-generation antimalarials. 1. What methods have been employed at MMV to accelerate the collection of this data? In collaboration with the Queensland Institute of Medical Research and Prof. James McCarthy, we developed the Challenge Model – a new approach to testing candidate molecules in individuals with malaria, without putting patients at risk. Healthy volunteers are inoculated with a small number of red blood cells infected with P. falciparum malaria. We closely monitor the level of parasitaemia in their bloodstream using a highly sensitive technique known as quantitative Polymerase Chain Reaction (qPCR). This technique enables us to ensure the volunteers are never at risk. They are then treated with the candidate drugs and we use qPCR to characterize the drug’s effects against the parasite.2 So far, the Challenge Model has been validated by testing five already approved antimalarials. The data we generated replicates what has already been found in clinical trials of these medicines. 2. What approaches have been adopted to streamline the use of these data? We have recently adopted a PK/PD modelling approach. We take aggregated raw data and determine relationships between concentration and efficacy using the power of maths; we can then make predictions about how a compound will behave in humans. Predictions can then be confirmed in clinical trials, leading to a cycle of learn and confirm. The approach is well established in other therapeutic areas. All the knowledge and new data we can now generate throughout the development process, thanks to the Challenge Model, for example, mean we can use the approach in malaria too (Figure 1 below). 3. How will these approaches improve the research and development process at MMV? Typically in R&D, medicines are trialled first in healthy volunteers to help determine safety, before being testing in patients to determine if the experimental medicine actually works (efficacy). The Challenge Model can determine efficacy at the same time as trials in volunteers are initiated to determine safety. Use of the Challenge Model also means that when we come to trial a drug in patients we can be more certain of the optimal dose. 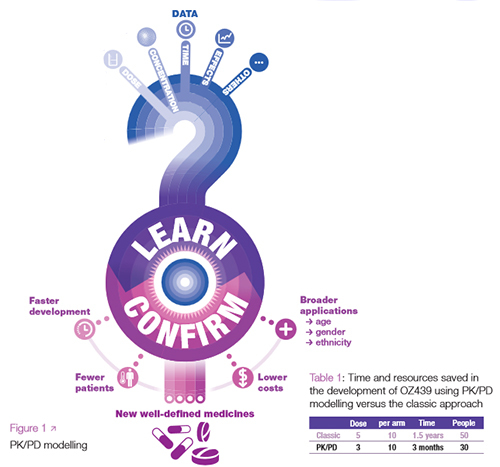 The PK/PD model ensures all data collected – preclinical and clinical – are used to the full, creating a global view of the drug and parasite interaction. These approaches taken together mean we require fewer patients in clinical trials, and are able to generate more data in less time at a lower cost (see Table 1 below). By obtaining more data earlier, we can make informed risk analysis and improve portfolio management. Pharmacokinetics (PK): what the body does to the drug, which determines where and when the drug will have its effect, for how long and at what level of intensity. Pharmacodynamics (PD): what the drug does to the body, which determines how the drug behaves and exerts its therapeutic effect. 1. Angulo-Barturen I et al. “A murine model of falciparummalaria by in vivo selection of competent strains in non-myelodepleted mice engrafted with human erythrocytes.” PLoS One. 3(5):e2252a (2008). 2 McCarthy JS et al. “A pilot randomised trial of induced blood-stage Plasmodium falciparum infections in healthy volunteers for testing efficacy of new antimalarial drugs.” PLoS One. 6(8):e21914 (2011).